From the beginning artists sourced nature to create art: paint originally made from plants, sculpture formed from stone and clay, and now artist reuse discarded plastic for creating art. Some artists use this plastic and other trash-destined debris in their artwork for both material and conceptually as embodied points of view onto the world they live in, and a few, ahem…perhaps, one, consider human detritus as simply anart medium without reflecting on or moralizing it’s impact in our world. 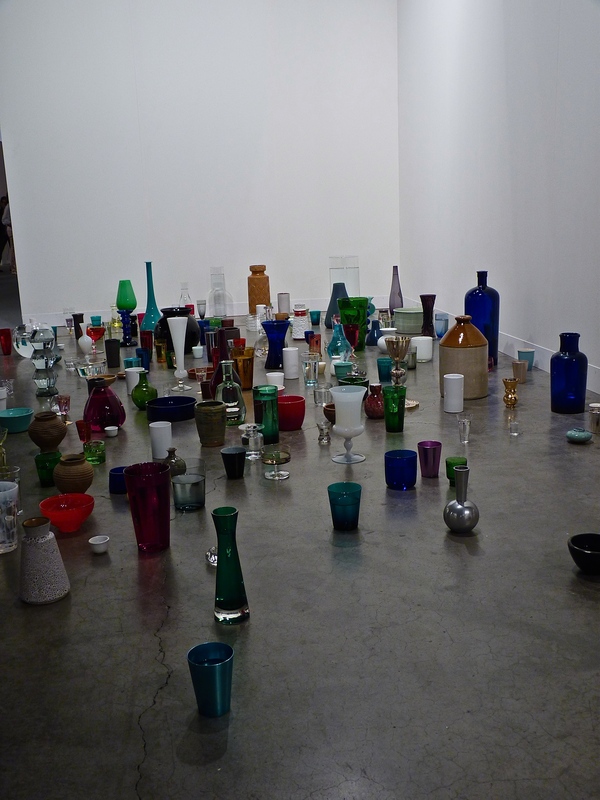 Tony Feher’s material is our civilizations toss-a-way packaging. He finds delight in plastic bottles, but also boxes, and bags with labels removed yet easily recognizable by their trademarked shape. With a wink to modernist sculptors before him and well, the public, his audience, he creates serious sculpture (or at least with serious price tags). Is he intentionally drawing attention to the wastefulness of excessive packaging, or is he intentionally drawing our attention to how branding influences our visual vocabulary that consciously and unconsciously manipulates consumer choices. Is he ridiculing our addiction to consumption of both wasteful, trash-bin-destined debris and at the same time passionate global art consumption? My inclination is that he doesn’t think about important environmental issues nor is this what his art is about, in his esteem; but, as they say, when the art leaves the studio, the object takes on its own symbolic in the world, it carries it’s own meaning—the place in which to access the real the imaginary must be conjured. Another ambiguous work of art by Kris Martin, Water, 2012 an assemblage of various size, shape, and colored glass vessels, each containing water, either half full or half empty, depending on the viewers perspective seems to inquire into the worldly water issue. Does each vessel represent all the nations in the world and our dependence on water for existence? Is the piece questioning how much more time do we have before the half full glass empties? Martin’s art ponders humankinds most vital issues, like the fleetingness and fragility of existence, mortality, time; albeit, he challenges the seriousness of his art with a wink and whimsical playfulness, like an art jester. On the other hand, Alejandro Duran leaves no ambiguity about the intention of his art. 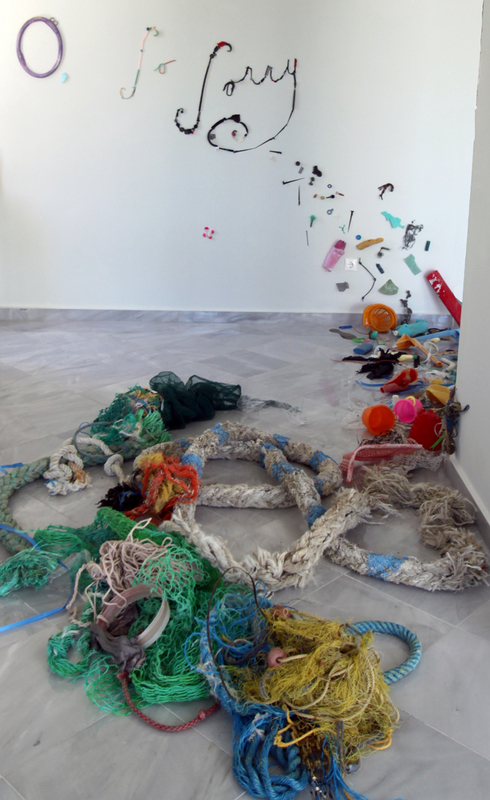 His latest project Washed Up, he states is intentionally to address the issue of plastic pollution. He focuses his lens on the debris from around the world that wash up on the shores of Sian Ka’an in Mexico making Andy Goldsworthy like forms and capturing them in photography. Richard Lang and Judith Selby Lang turned their daily strolls along the Kehoe beach in Point Reyes National Park into a collaborative art project. They consider themselves artist archeologists. Since 1999, they began gathering and sorting by color and or theme the varied thermoplastic junk or our throwaway culture and recreating it into inspired colorful art pieces. Pam Longobardi 2013 exhibition image. Underlying all of Mark Dion’s art is a high-minded ecological agenda. Like the other aforementioned artists, Dion considers himself an explorer, a historian, and a dilettante archeologist. I see him as an intellectual ecological artist. He creates installations or assemblages that are a take on the form of the tableaux-like scientific arrangements found in natural history museums or historical cabinets of curiosities. Like Longobardi he is fascinated by the histories the found objects hold, he treasures the stories a washed up piece of plastic tells us about civilization as much as he would value discovering artifacts from the Antikythera shipwreck. 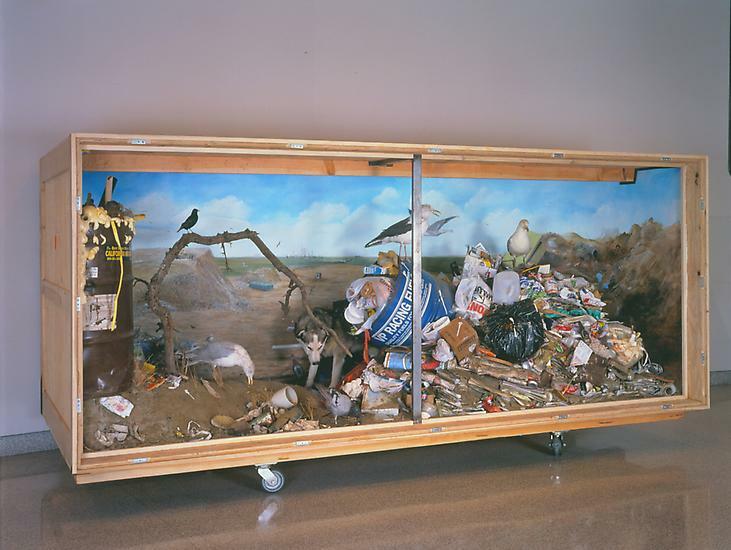 Mark Dion, Landfill 1999-2000. Mixed Media. Image courtesy of Tanya Bonakdar Gallery. 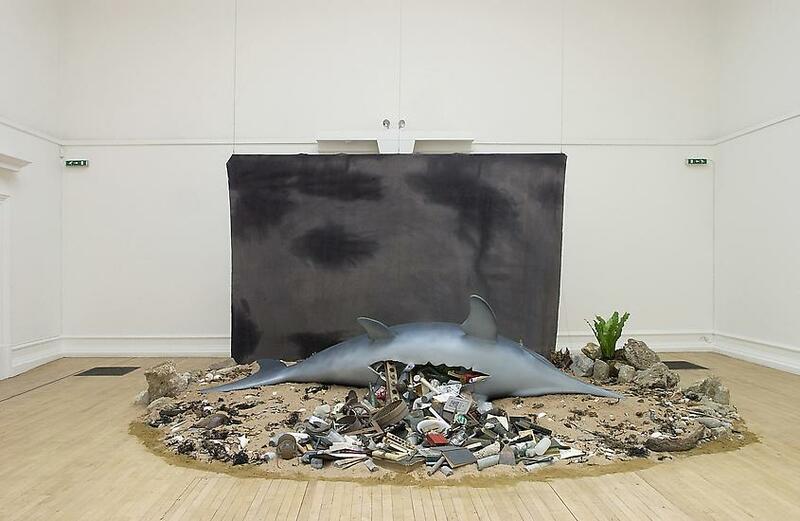 Mark Dion, Ichthyosaurus, 2003. Synthetic Ichthyosaurus, backdrop, misc. obects, sand, rocks. image courtesy of Tanya Bondakdar Gallery. 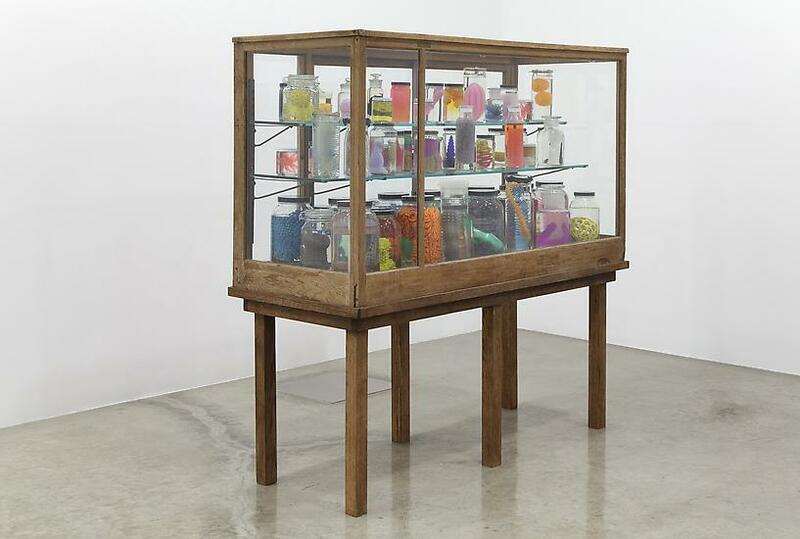 Mark Dion, Marine Invertebrates, 2013, 70 objects in glass jars, isopropyl alcohol, glass and wood cabinet. image courtesy of Tanya Bondakdar Gallery. 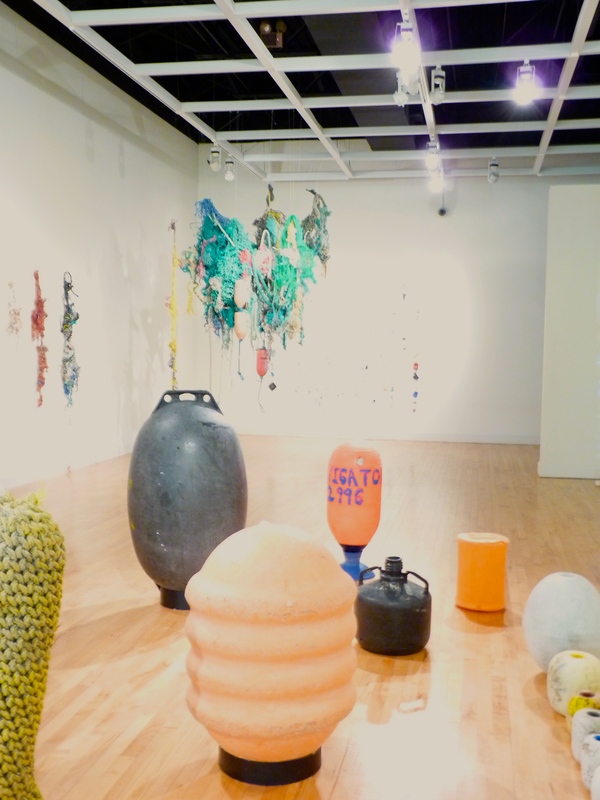 The common theme connecting many of the artists who use plastic and humankinds detritus as their material is how they begin to look upon their material from the viewpoint of an archeologist and a conservationist, as well as an artist. I, too, find the history of plastics in our civilization intriguing; although, I wonder how future generations will remember us. Just as we learn about the precision of the Incan architecture and the aesthetics of the Greek design, what story will the heaps of plastic and technological debris say of our era?